Orienteering is a competitive international sport that combines racing with navigation. It is a timed race in which individual participants use a specially created, highly detailed map to select routes and navigate through diverse and often unfamiliar terrain and visit control points in sequence. Courses also can be enjoyed as a walk in the woods, with difficulty levels from beginner to expert offered at most events. The history of orienteering begins in the late 19th century in Sweden, where it originated as military training. The actual term "orienteering" was first used in 1886 at the Swedish Military Academy Karlberg and referred to the crossing of unknown land with the aid of a map and a compass. The competitive sport began when the first competition was held for Swedish military officers in May 1893 at the yearly games of the Stockholm garrison. The first civilian competition was held near Oslo, Norway, in October 1897. The sport gained popularity with the development of more reliable compasses in the 1930s. The first international competition, between Swedish and Norwegian orienteers, was held in 1932. The first orienteering events in North America were held on Nov. 10, 1941, at Dartmouth College in Hanover, N.H.
Where Do You Hold Meets? 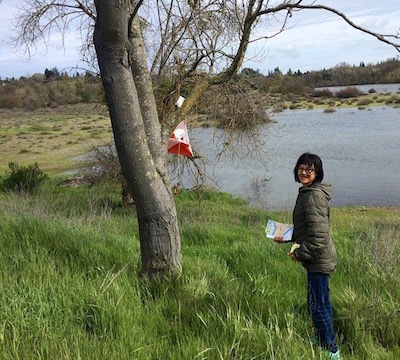 We have maps in parks along the American River, Lake Natoma and Folsom Lake. We also have maps for Orangevale Community Park, California State University, Sacramento, and Sierra College in Rocklin. See our sites. Most of the time, a control is an orange-and-white nylon square bag that looks somewhat like a kite (see picture). When you find it, you punch your card with the punch hanging from the bag; that shows you've found it. Some clubs use electronic punching, but GCO does not, with rare exceptions. The most common kind of course is a point-to-point, where you must find the controls in numerical order. Meets have three to five courses, ranging from beginning to advanced. Some meets can be Score-O or Scramble, where you find controls in any order within a time limit. There are a few other variations, also. Our fees: $10 for each adult and $5 for each child or youth (ages 7-18) for non-members and $8 for adults and $4 for children or youths for members of GCO or other Orienteering clubs. A second course is $2 per person. You can also rent a compass for $1 plus a refundable $5 deposit. Wear clothing suitable for the weather and a hike along and off trails. Shoes should be comfortable for walking or hiking. Some areas have poison oak or thistles and long pants are advised. You should carry water if you want; most courses have water at one control. Bring a compass if you have one; we have some for rent if you do not. Our meets go on rain or shine, as long as the park remains open. Will I Learn How to Read a Map and Compass? Beginning courses stress map reading, while the compass is used more for intermediate and advanced courses where you go off the trail. At every meet, we offer beginning instruction. Check out the How To Orienteer link for some help. The more courses you do, the better you should get at reading a map and using a compass!